Who loves travel? We do! And we’re teaming up with TravelingMom to share our love of technology and travel (and giving away some awesome tech) on our Nov. 10 tech and travel Twitter chat. Join us to share your favorite gadgets, learn about some cool new ones, and pick up tips for getting the most out of the tech you have without it overtaking your family time during the holidays. Fire HD Kids Edition tablet from Amazon.com. 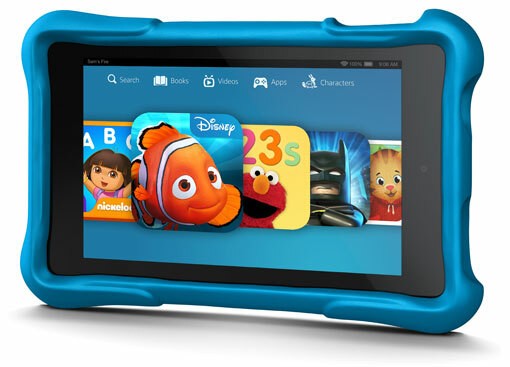 The Fire HD Kids Edition is a regular Fire HD, but it’s outfitted with a kid-proof protective case, a 2-year worry-free guarantee (if your child breaks it, you get a new one) and comes with 1 year of Amazon FreeTime Unlimited (5,000 free videos, books and apps). AT&T Unite for GoPhone Mobile Hotspot and $25 data refill card from AT&T. Enjoy 1.5GB of data on AT&T’s high-speed 4G LTE mobile broadband network anywhere you travel. Thinium Charge dock (a $49.99 value) from Thinium. With this unique, ultra-slim charger, you can charge directly from a wall outlet or your computer without the need for a cable. Omaha Steaks gift cards. Three $30 gift cards. I think it would be great having as I use my laptop out of the house frequently. I would be able to have access to the internet so that I can stay connected to my family. It would be awesome on roadtrips to keep little one happy or look for directions. So far so good but had niece destroy computer. I have paid up to $3. I’d love to have a WiFi hotspot especially for my gadgets. would love a hotspot as it would be helpful when we take long road trips! my daughter has broken my iPad volume control buttons! It depends, but I will pay up to $5 a month for now. I think an AT&T hot spot would be great for our family because we are always at sports event where internet connection is very slow if we got any. It would be great to show with the family right away. What’s my biggest worry about using public wifi? Getting my personal information stolen. My oldest son dropped his tablet in the toilet last year. It wasn’t a good day. How much $$ do you spend buying apps, etc., to keep your kids entertained? I try to get as many free apps as possible. But if I see some that are $.99-$4.99 and I believe they are worth it I buy them. Spend some on apps! Not a lot but a little!